Thank you so much for visiting~ Comments and favourites are very much appreciated! so adoeable. I love the way yiu drew the alolan vulpix. So cute, love the blue hues! And the eyes! Aaaahhhh this is so cute! I love the floof! what do you use to make this? Your art is just always perfect, there are never mistakes in your pieces of art, meh, how do you do that? Wow this is incredible. It's like you hit every point of its design perfectly and even improved on it drastically by adding your own twist to it. Can I have her as a pet? When I will catch my own, I think I will call her Angel. so cute!! i LOVE this new vulpix!! Adorable! I am so loving the ice fox! 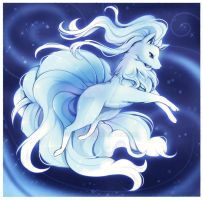 <333 You planning to draw ninetails as well? Existing Pokemon with new forms!